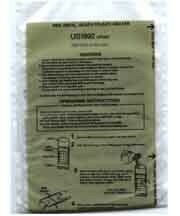 12-pack of MRE Heaters are chemically activated by water. Place entree pouch in a heater bag, add water and in 10-15 minutes you have a hot steaming meal. Use one to heat, two to thaw frozen. No stove, fuel, or cookware required when you have the MRE flameless heater—just add a tablespoon of water and watch it heat up! MRE flameless heaters are made from our contracted manufacturer—who also makes these products for the U.S. military! This slim profile pouch is convenient for backpacking and storage. Perfect for heating emergency MRE food supplies. These one-time use flameless heater, when mixed with water form a safe chemical reaction that heats your MREs (of whatever) to over 200° F in minutes. Hot food not only tastes better, but it's a source of warmth in cold conditions. If disaster ever strikes you or your family, you aren't going to want to worry about starting a fire or finding a stove. These lightweight flameless heaters where orgionally intended for use by the U.S. military, their quality is unmatched. Instructions: slide the foil MRE pouch or meal into the heated pouch with a teaspoon of salt water; after a 10-15 minutes, you have a steaming hot meal that you can enjoy eating. Use one to heat, two to thaw frozen. With an unlimited storage life these heaters are ideal for hiking/camping, auto emergency, or 72 hour survival kits. Flameless heaters are each a one-time use only.